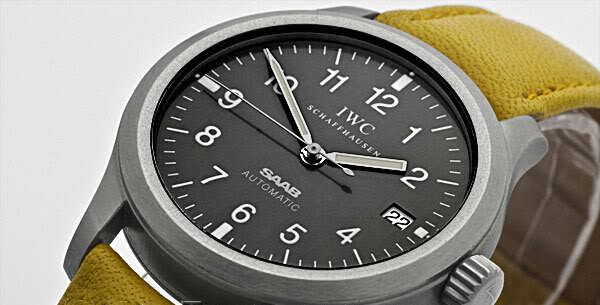 The two most import catalysts for the development of aviation watches were early aviation record attempts and war. 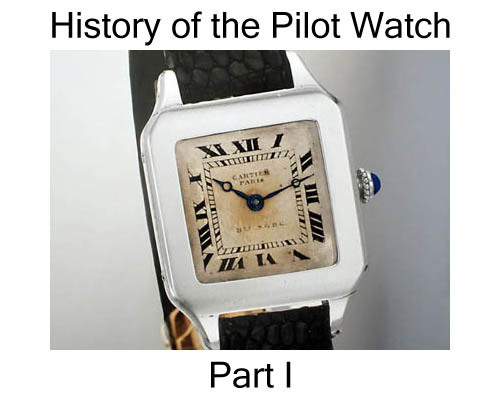 World War I finds watch development between the pocket watch and the new wristlets with the British issuing pilots pocket watches. British Mark IV.A and Mark V pocket watches are an example of WW1 military aviation. World War I conjures childhood images of bi-planes fitted with a machine gun to fire through the propeller, the Red Baron’s plane emerging triumphant from a dogfight, and the endless lines of trenches on the ground below. Add the romanticism of aviation to the romanticism of war, and you have an iconic, if mistakenly idealized, pairing. War’s demand for precise navigation or coordinated attack meant that the world grasped the importance of horology. 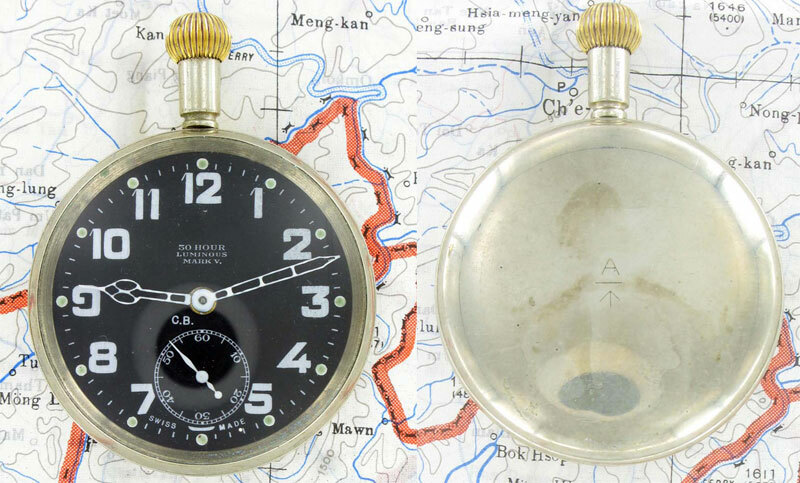 When “balloon busting” or taking out observation balloons, British pilots flew with the pocket watch Mark IV.A (1914) and Mark V (1916). 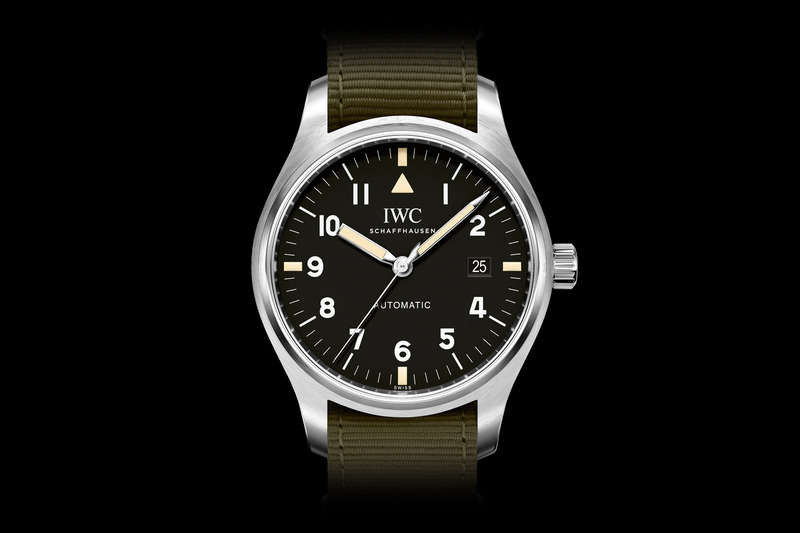 Case back markings, unique to country, branch of service or intended use, are a distinguishing characteristic of vintage military watches. Great Britain’s characteristic mark was the broad arrow. For the collector, case back markings are key identifiers and an added authenticity safeguard. These markings meant that the watches were official military equipment, procured through contracts and mass-produced for combat pilots. On April 13, 1912, the British Army’s Royal Flying Corps (RFC) was formed to develop a military and naval wing. Just prior to the war, given the unique needs of the fleet, the naval wing severed with the RFC to form the Royal Naval Air Service (RNAS). In 1918, these two separate aviation branches merged again to form the Royal Air Force (RAF) who continued to use the Mark watches. The RFC aviation issue watches had an underscored capital A with a broad arrow pointing upward underneath it. Repairs to the watch meant an additional caseback stamp marking the repair status. One look at the caseback, and the markings tell you, British issue. 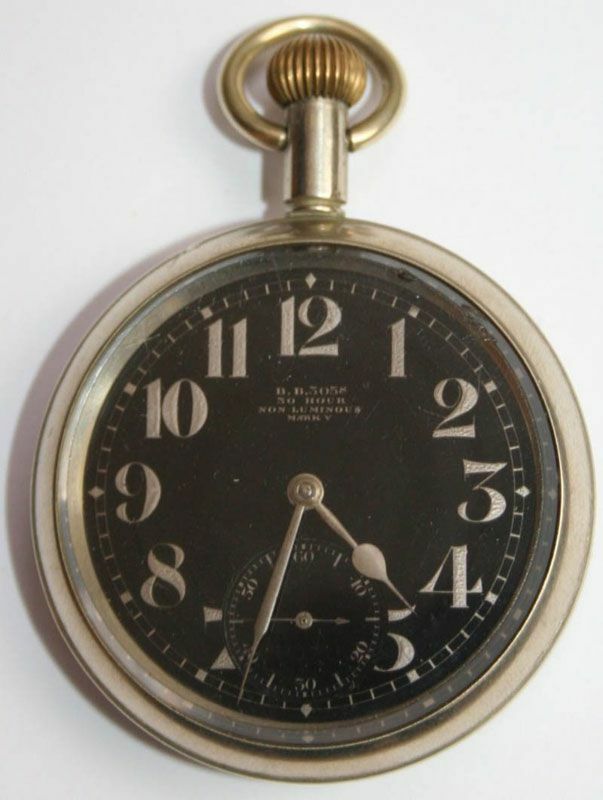 Mark IV.A (1914) and Mark V (1916) pocket watches were standard issue. The RFC and RNAS had near identical watches, but the RNAS watches were predominately the eight-day variety and the RFC, the 30-hour. Once inside the aircraft, these watches became chronometric instruments, which the pilot fit into the instrument panel. As a result, the Mark IV.A and Mark V had long shank winding stems to extend beyond their instrument panel housing for mid-flight winding, earning the nickname, cockpit watch. 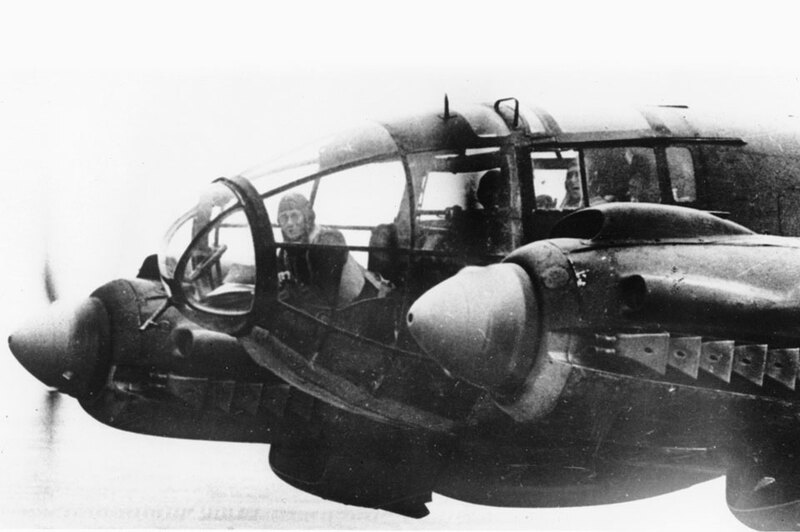 German pilots, on the other hand, wore inverted watches suspended from a fob on their flight suits. Zeppelin pilots had rapid access to time, and the hanging, inverted dial was right side up when held. 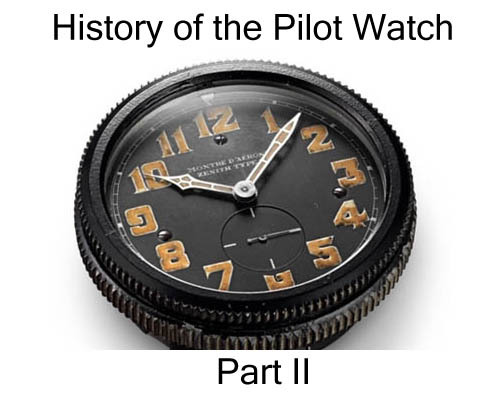 These adaptive measures were precursors to the pilot watch worn on the wrist. 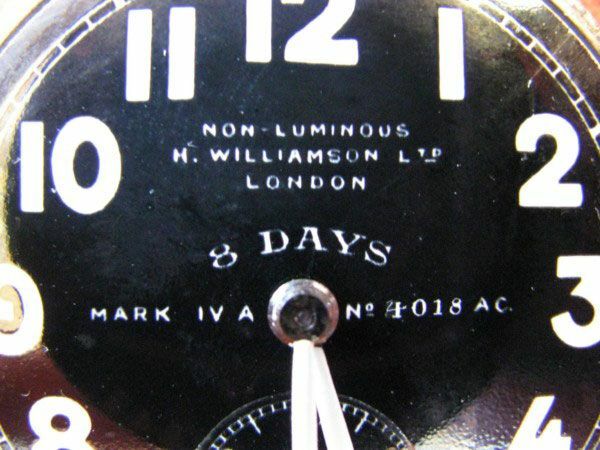 ￼Numerous manufacturers supplied Mark watches with unsigned movements; retailers like H. Williamson Ltd. Of London or Birch & Gaydon Ltd. of London distributed these anonymous watches. 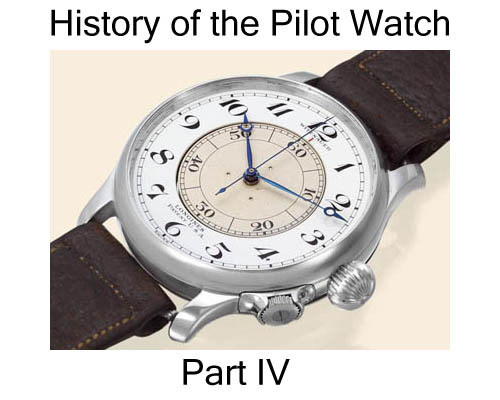 The Smith watch company was a leading provider of Mark IV.A watches and bragged, “Because of its splendid time keeping and unfailing accuracy this instrument has gained the reputation of being the most successful watch yet designed for constant use on Aircraft”. The four known manufacturers of Mark V watches were Zenith, Omega, Doxa and Electa. ￼Mark watches had various configurations. 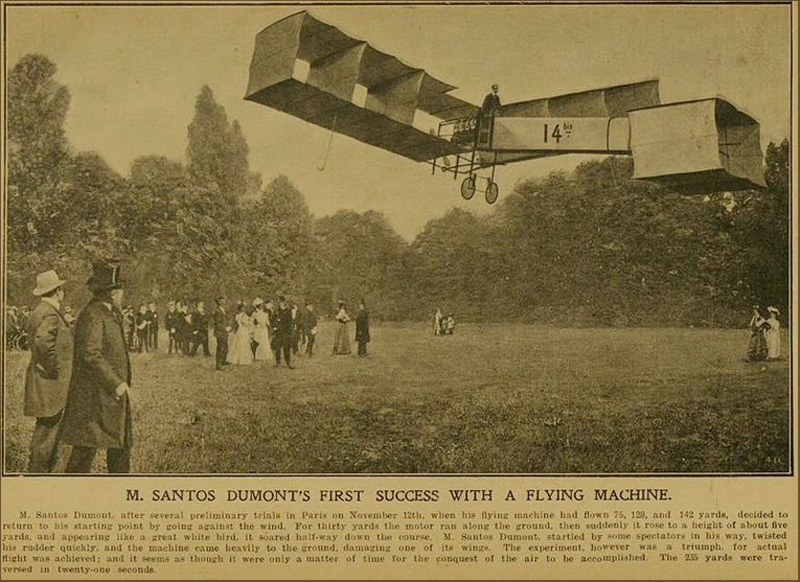 Night flying required the issue of luminous editions so that pilots could monitor fuel consumption and navigate in the dark. The eight-day Mark V model was ideal for longer flights. The rigors of flight demanded thermal compensation, accuracy and shock-resistance. Form follows function, and the aviator’s tool was shaped by its intended use, and nowhere was that use more crucial than in combat. Forged in the fires of warfare, the pilot watch’s functionality expanded and would continue to expand. ￼War is serious business. Its existence is evidence of human failure, and war’s sometimes unavoidable necessity requires better than the best effort possible. The exigencies of war called the watchmaking industry to respond with their best effort, making war a catalyst for horological advance. WW1 was the beginning of an appreciation of the watch as essential military equipment. Yet after the horrors of World War I ravaged Europe, Omega issued watches in France which were embossed with the dove of peace. Without celebrating violence, we can celebrate the technological feats achieved amidst appalling circumstances. Mark IV.A and Mark V watches exemplify WWI horological achievement. 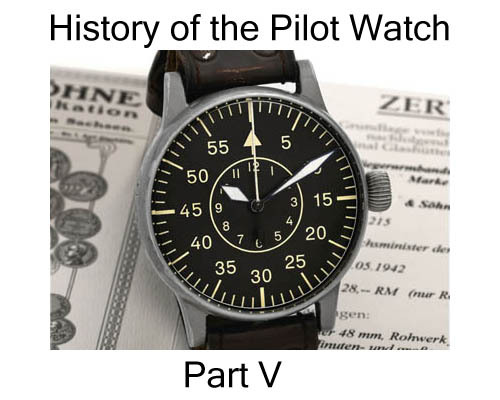 Check out History of the Pilot Watch Part I, II, IV and V by clicking on the images below. 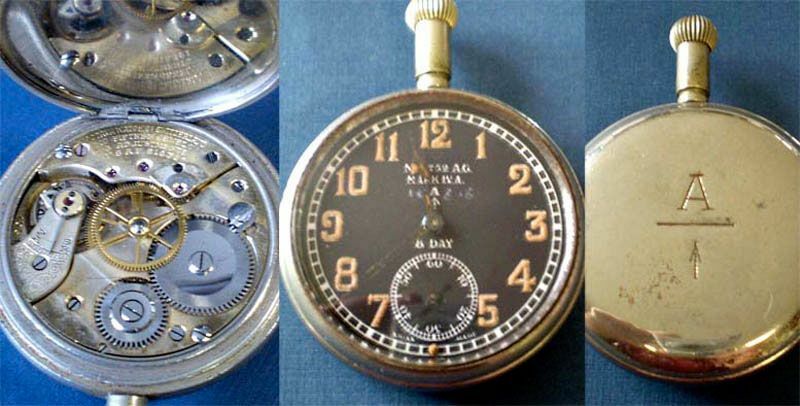 hi i have got a watch in exerllent condition with the brass case out of the bye plane i would like to get a value of this watch what do i need to do regards graham phillips. You could try to find similar models in Anitiquorum or Christies online catalogs of previous auctions. That could help to set a rough estimate. Hi how do I go about finding out about my watch it is a Mark IV.A Watch but when I opened it up it had hand written a number (65614). I am really interested in finding who the watch belonged to. Any help please guys? Hi, I have a Mk V 30 hour non luminous pocket watch which was given to me by my grandfather many years ago. On the face it has the following “BE 1388” and inscribed on the back it has “A (arrow) Sth 1091”. I am really interested to find out more about the markings and if I would be able to find out who owned it from this markings. Any help would be greatly appreciated. 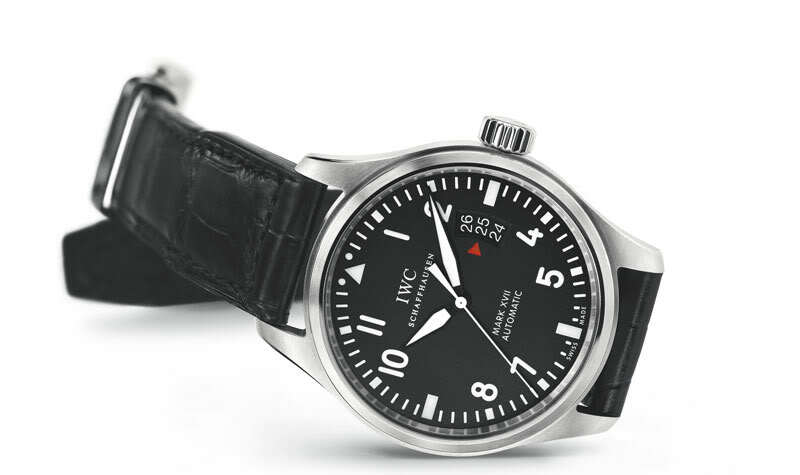 One of the distinctive aspects of military watches is their unique markings used to identify them. These marking range from the general to obscure. The capital A and broad arrow (mentioned above) is a general marking of the Royal Flying Corps for pocket watches (typically 1914-1917). The Military Watch Resource Forum is a good resource for the more obscure markings, which are likely contract numbers or military issue codes. I would suggest making an inquiry there: http://www.mwrforum.net/forums/. Hello, can anyone help me with my question? I have a MKV.A H Williamson (8days) cockpit watch with ‘W’ a crows foot then a ‘D’ (for war department) stamped on the caseback. My understanding is that this dates the watch to 1914. The watch does not have a loop as was standard with cockpit watches. All the cockpit watches I have seen so far have black faces/dials, however mine has a white face? now all the markings are the same as the black faced counterparts…but why a white face? I will add that it does match the watch in every way and does not look like a replacement, can anyone help please? @Dave – Many of the white face dials were naval counterparts to the aviation pieces. You might try the forums for more precise information on your specific piece. Doxa 30-hour non-luminous Mk V, black dial marked BE 790. Case is completely unmarked, and pendant is short, with a loop. Can any one date this ?…I’m assuming that because it is a Mark V, that it is a 1916 model ? Very interesting site and very well described and explained. Thank you. Hi, I know it’s an article about watches but I just have to chime in with a non-watch related comment, as the caption under the WW1 plane picture is terribly wrong. Firstly, there was no such plane as “Sopwith SE5”. The Royal Aircraft Factory tended to produce S.E.5 and S.E.5a biplanes, whereas Sopwith manufactured models such as “Pup” and “Camel” but the picture shows neither of them! 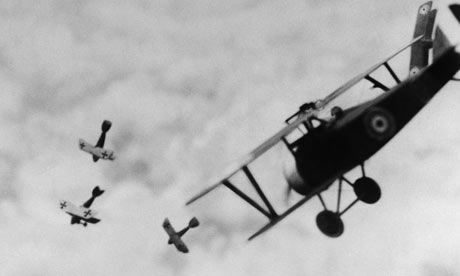 It’s most probably a pair of Nieuports 27 attacking three German Albatros D.III/V planes. I have an RFC pilot’s cockpit watch – 30 hours, non luminous, Mark v, B.H. 2245, which belonged to my wife’s uncle, Joseph Pascoe (an RFC pilot), who was Raymond Collishaw’s first cousin. We are part of Raymond’s Welsh side of the family. Most of these “pilot watches” are not really useful at all any more to actual pilots. Your very basic $10-$20 Casio LCD digital watch with time, date, stopwatch function, countdown timer, alarms and backlight is far more accurate and easier to read than all these old analog face watches marketed as “pilot watches”. Every disposable cellphone out there that displays time even is far more accurate than all of them. If you spend more than $30 on a pilot watch, you wasted every dollar above $30 for absolutely nothing. They are not even collectable with pilots. BTW, there’s no SE5a in the black and white picture that labels it an SE5a. I just received an S. Alexander & Son non-luminous 8 day cockpit watch Mark IVA No.955Z with a black face and on the back of the case A(upward pointing arrow)S engraved in large capital letters. I would like to set the time on it, but the winding stem is resistant to pulling out, and I don’t want to damage the winder. What is the proper method to set the time. Could you elucidate the procedure for me?